When Sharon McBean's then three-year-old daughter started walking around on her "tippy toes" and begged to start ballet classes, this Birmingham, U.K.–based mom encouraged her newfound excitement. 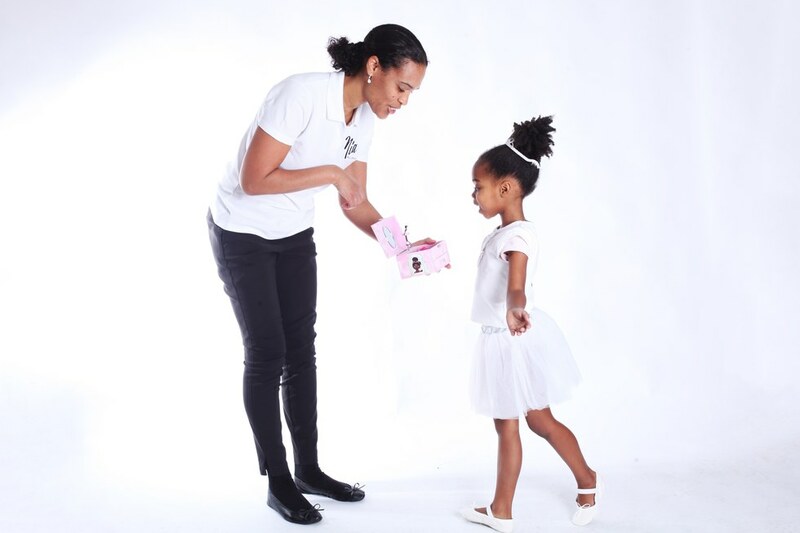 After seeing her perform at a ballet recital in December 2014, McBean's mother bought her young granddaughter a ballerina jewelry box for Christmas. "It had a white ballerina," said McBean, "And I thought, why would you do that? Why wouldn't you get one with a black ballerina?" This question sparked a multi-year search to find a ballerina jewelry box that looked like the dancer her daughter dreamt of becoming. McBean combed the internet, including international sites like a South African version of eBay, before her cousin suggested that she just make the box herself. McBean founded her company, Nia Ballerina, a year ago this summer. We can all remember the simple beauty of a ballerina jewelry box, a home to hide away your treasures while a tiny dancer figurine endlessly rotates to the soft refrains of Swan Lake or The Nutcracker. But for McBean, getting her daughter a jewelry box stemmed way beyond a simple toy. "I really wanted my daughter to be able to see herself. I thought it was important for her to see herself represented," said McBean. Issues of racial representation in ballet have been at the forefront of dance world discourse for the past few years, with stars like Misty Copeland and Michaela DePrince (McBean's daughters' favorite dancer) using their fame to fight for equality. But the advances that we've seen, in terms of an increase in company and school efforts to become more diverse, have yet to filter down to ballet-themed toys for tutu-loving kids. McBean also believes that while things have changed more rapidly in the U.S., in the U.K. "black ballerinas and black girls doing ballet are few and far between." McBean, a former social worker and self-proclaimed "mum," had no experience with production and manufacturing. She speaks of this past year as an immense learning curve, navigating communication with illustrators, marketers and Chinese factories. But last July, the initial order of 2,000 jewelry boxes in two different designs finally showed up at her door. With the grassroots advertising efforts of her friends on social media, word got around—McBean sold half of her stock within the first week. She's now coming up on 5,000 sales. "I get so many parents emailing me at random just saying how important it was for their child to see themselves represented," says McBean. McBean and her daughter. Photo Courtesy of Sharon McBean. The choice of the name Nia emphasizes the drive behind the product; it means "purpose" in Swahili and is McBean's daughter's middle name. And this is just the start for Nia Ballerina. McBean has been working with an illustrator to develop a character with the hopes of eventually making dance bags, a ballerina doll and even a picture book. She's also planning ways to rebrand and to give the boxes a more professional look. "The way I've seen my daughter embrace this journey, it's encouraging her to want to continue ballet. I need to do this for my daughter. She needs to see herself represented."